The members of the Hospital Thrift Shop Board of Directors presented Nantucket Cottage Hospital president and CEO Dr. Margot Hartmann with a check on Monday following another successful season in business on India Street. The $427,610 gift represents the Thrift Shop’s largest annual contribution in nearly nine decades of steadfast support of the hospital. At the Thrift Shop Volunteer Appreciation Dinner in July, the Thrift Shop presented Dr. Hartmann with a check for $500,000 which completed a pledge made in 2015 to the hospital’s capital campaign for its new facility. Since making this commitment, the Thrift Shop Board of Directors has added funds to the pledge account at the end of each year, in addition to the annual gift presented to NCH each November. This July, $41,610 was paid into the pledge account in order to bring the total up to $500,000 which completed the pledge earlier than the due date of November 1, 2018. 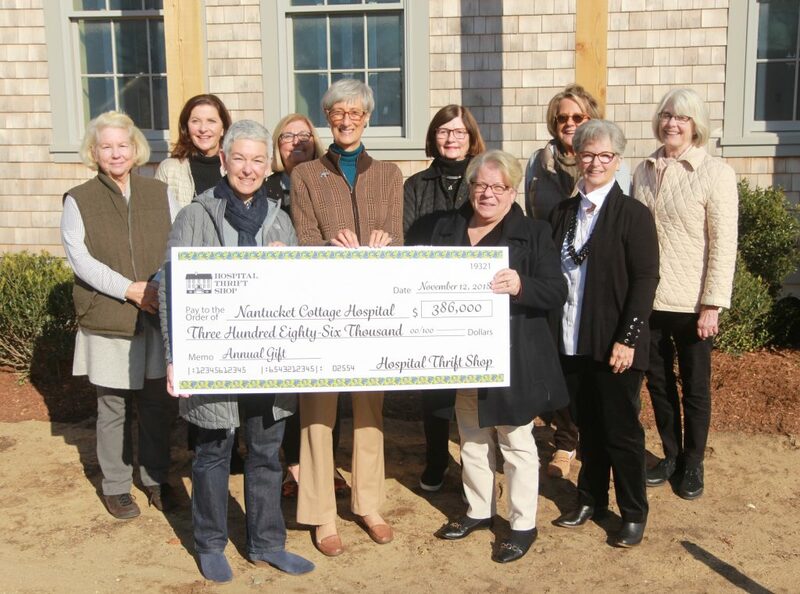 Therefore, the total gift to the Nantucket Cottage Hospital in 2018 was $427,610. The Hospital Thrift Shop sells merchandise donated by island residents and visitors – anything from used books to furniture to artwork – from late May through mid-October, and operates as a separate non-profit organization. With a mall staff, a stalwart team of volunteers, and a dedicated Board of Directors, The Thrift Shop remains a favorite for island residents and visitors both in terms of donations toward a worthy cause and as a shopping destination. The 2018 season marked its 89th year in business on India Street. The new equipment that will be purchased by the hospital with this year’s donation from the Thrift Shop includes an EKG machine, a defibrillator, an ultrasound device, a trauma stretcher, a CPR machine, a portable digital X-ray machine, a cooling/warming blanket system, a platelet incubator/agitato system, as well as a TUG robot system and new workflow software. In addition, the Thrift Shop is funding the creation of handmade furniture for the new hospital that will be crafted out of the wood from the two large beech trees that had to be taken down in order to build the new hospital. The old trees were skillfully milled by islander Sam Myers and have been cured over the past two years in the workshop of Barber & Sons, Inc., an island woodworking and building company. In an effort to repurpose these two beloved trees, the hospital has contracted with Nate and Beau Barber who are now working to create tables and benches for the second-floor lobby and dining area of the new building. The Thrift Shop was founded in 1929 when a group of dedicated volunteers came together to provide affordable clothes and household goods to the island community. Its first gift to the hospital that year was $603. Since then, the Thrift Shop has given more than $4 million to the hospital. Many have contributed to this success: residents who donate gently used items, shoppers who get great deals, numerous volunteers who devote substantial time and energy, and a manager and staff who run the daily operation of this thriving organization. It’s a tradition that continues to generate great returns for the community by providing affordable goods and for the hospital by providing ongoing financial support that will benefit Nantucket patients into the future. The Thrift Shop has requested in return for its efforts that island residents remember to donate gently used clothes and household items that are no longer needed. Donations from the community are critical to ensure the Thrift Shop’s continued success.